In the Chest You Find . . .
Enchanted swords . . . marvelous rings . . . animated armor . . . wands and staffs of devastating power. 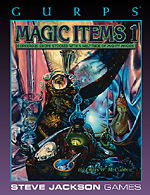 Here is a catalog of hundreds of original and imaginative enchanted items for use in any campaign, from exotic trinkets to mighty artifacts. Categories include swords and weapons, armor, wizardly tools, thief's supplies, clothing, jewelry, healing tools, necromantic items and curses, tricks, and traps. Discovering Magical Items – advice to GMs on getting magical treasure into the players' hands . . . and out of them! The Magic Trade – a complete and realistic guide to the economics of enchantment in a medieval fantasy world, including profiles of the typical enchanter, enchanter's patron, and magical merchant. The Compleat Powerstone – everything you ever wanted to know about the enchantment and economics of powerstones, including tables for quick generation of the powerful gems. 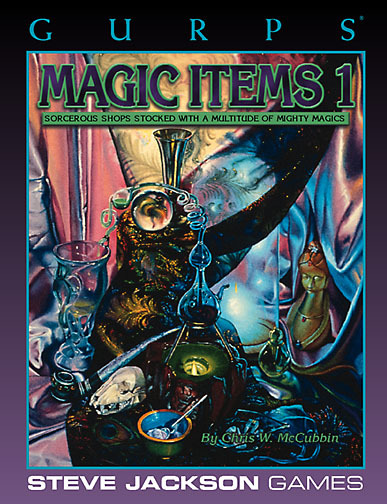 A reference table of costs, duration, and powers, covering all of the hundreds of magical items previously published in GURPS Magic. GURPS Magic Items 3 – Enchanted handguns . . . sorcerous spaceships . . . clockwork golems . . . from the Ice Age to the distant future, this book is full of intriguing and exciting artifacts for magical adventures.